The first time time a user clicks the 8x8 Analytics tab within Salesforce, they see a prompt asking for their Salesforce credentials. Note: We recommend registering while in Salesforce Classic Mode, rather than in Lightning Mode. You can click your profile icon to open a drop-down menu, and select to switch to the Classic experience for the installation. If you still see the Salesforce ID error from before you configured the ID, try refreshing your Salesforce page. This is a one-time configuration for your organization. Enter your Salesforce username and password (not your 8x8 credentials), and Security Token Code, and click Register. In Salesforce, click your name in the upper-right corner of the page to open your user menu, and go to My Settings. Click Personal, and select Reset My Security Token from the menu. Check the email associated with your Salesforce account for a message titled Your new Salesforce security token. Select and copy the string of random characters at the end of the line marked Security token (case-sensitive). Enter your Salesforce username and password, paste in your new Security Token, and click Register. From this point, it takes about 20-40 minutes to download the application. When the download is complete, refresh the whole page. You input your Salesforce credentials incorrectly. Your Salesforce Security Token has expired. One or more default fields, such as ExpectedRevenue, are not visible to the user whose credentials are being used for the registration process. You must correct for each field that returns an error during registration. You can check the registration status by occasionally refreshing the Salesforce page in your browser. Note: This issue can only be fixed while in Salesforce Classic Mode. Type <Field> into the setup search bar. Under Opportunities in the search results, click Fields. The Opportunity Fields page opens. 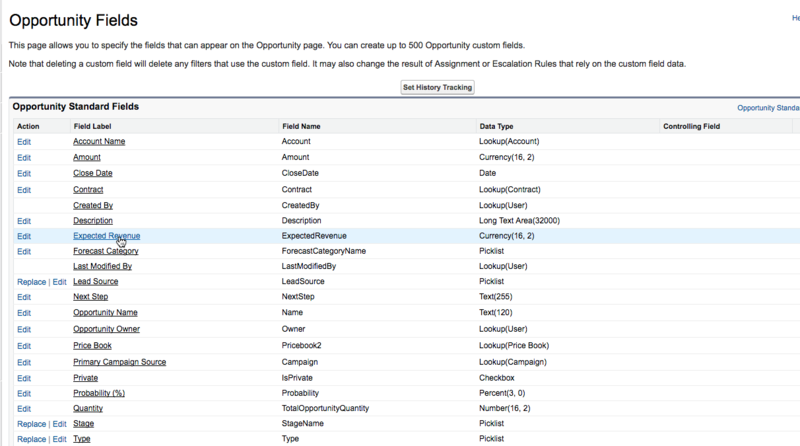 Click the desired field (in this case, Expected Revenue). Select the Visible check box for the profile of the user whose credentials are used for the registration process. You can make the field visible for other user profiles as well.